While most of the world celebrated Easter 2015 with church services and family get-togethers, Christians in the Syrian city of Aleppo spent the holiday digging through rubble to locate the bodies of 15 people who died after a ferocious round of rocket bombs fired by Islamic fighters rained down on a Christian neighborhood. 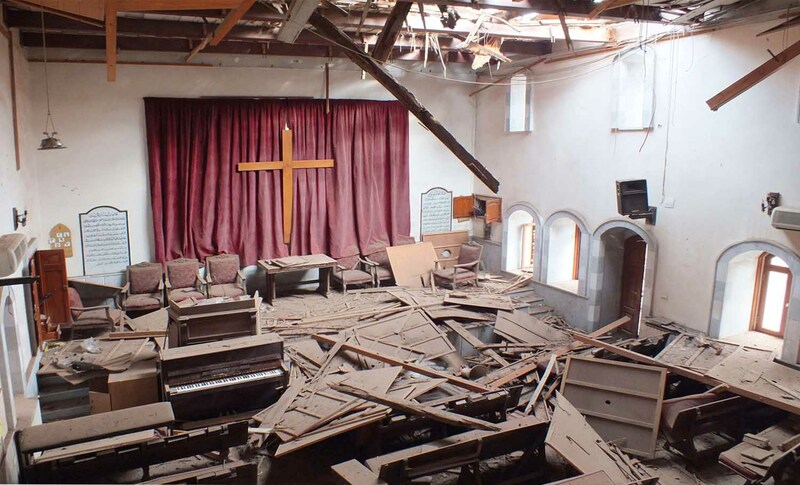 It was merely the latest assault on Christians in the city, which has seen some of the most intense fighting between jihadists and Syrian forces. Archbishop Jean-Clément Jeanbart, head of the Melkite Greek Catholic Archparchy of Aleppo, was on the scene immediately afterwards. Among the casualties was an entire Melkite Greek family of four, crushed to death when a section of their apartment building collapsed. One of Jeanbart’s grim responsibilities was to find a suitable spot for their burial, since the cemetery used by his Church for centuries is now a battle zone ringed by snipers. It was hardly the 72-year-old prelate’s first taste of tragedy. In October 2012, his own priest secretary and protégé, the Rev. Imad Daher, was nearly killed when a bomb exploded near the archbishop’s residence. Daher had to be helicoptered to Beirut for the first of seven surgeries, which, among other things, cost him one of his eyes. Not long ago, Jeanbart himself was driving to Beirut when an armed band shot out the tires of his car and forced it from the road, perhaps with the aim of either killing or kidnapping him. (Abducting Christian clergy has become a cottage industry.) Jeanbart and his driver escaped when a military convoy happened to pass by, prompting the assailants to flee. Jeanbart sat down for an exclusive interview with Crux on April 25 during a tour of the United States sponsored by Aid to the Church in Need, a Catholic group supporting persecuted Christians. Among other topics, he discussed calls for an international military response to IS, charges that Christian clergy in Syria are too close to the Assad regime, and the role played by Pope Francis on the Syrian conflict. The following is an excerpt from that conversation. Crux: How many Christians are left in Aleppo? Jeanbart: Before the war we were around 170,000. We don’t have reliable statistics today, but we may be around 100,000, maybe less. Most [who have left] aren’t very far away, in the southern part of the country or in Lebanon. On the other hand, some have gone to Europe, Canada, the United States, Australia, Sweden, and so on. We worry about these people, because we’re not sure they’ll ever come back. Crux: How are you helping people to hold on? Jeanbart: We provide a monthly stipend to around 475 families, with the idea being to pay them roughly half of what their salary used to be, since for the last two years there’s been no work. We offer food baskets, we pay scholarships to allow children to go to school, we provide some money for heating costs, we offer health care and we also offer shelter to those who need it. Crux: Has the Melkite Greek Church had any priests kidnapped? Jeanbart: So far, just one. We have no news about him, and no means of communication [with his kidnappers]. Crux: Let’s say you were kidnapped and somebody wanted $100,000 to get you back. Would you want your Church to pay? Jeanbart: I hope it won’t happen, because I’m helping thousands of people. It’s not that I’m something special, but … the truth is that $100,000 would represent very little compared to what I’m offering my people. If it came to that, it would be a good bargain! But I am not sure if paying ransom is a good idea. Crux: Where does the money you raise come from? Jeanbart: I’ve been a bishop for 20 years, and I’d never asked anyone for donations. Two years ago, when I saw what was happening, I wrote to a number of friends around the world, and they answered. There are also organizations such as Aid to the Church in Need that have helped, including some in the United States such as the Knights of Columbus. My aim is more than emergency relief, because for the most part that’s coming. Caritas and the Red Cross are helping, we’re helping, and in a way basic needs are being satisfied. What’s most important is that afterwards, we can do something to help people reestablish themselves and to be able to stay. This is my program, which we call “Built to Stay,” and it’s what I’m persuaded I have to do. I have to give Christians hope and confidence that their future could be good in this country. 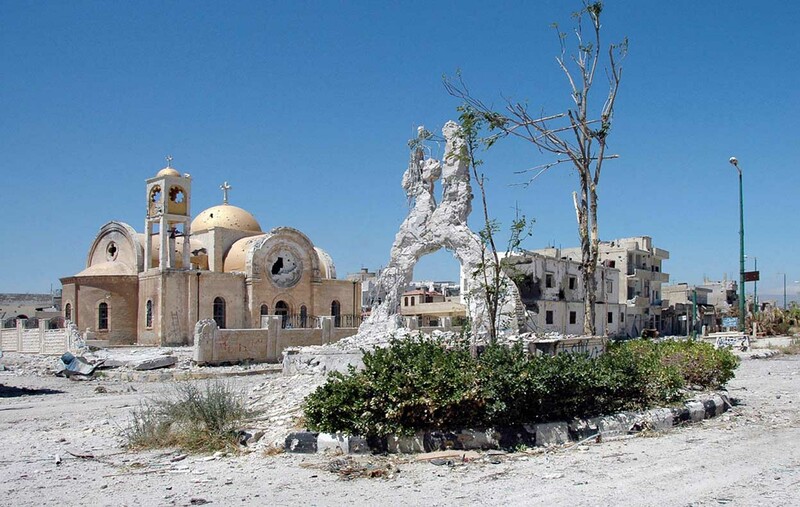 Crux: Why is the Christian presence in Syria so important? Jeanbart: I feel responsible for the survival of a Church founded by the apostles themselves. The first Christians in Syria were baptized the day of the Pentecost in Jerusalem, by Peter and the other apostles. … They spread all over the region and founded the Church. 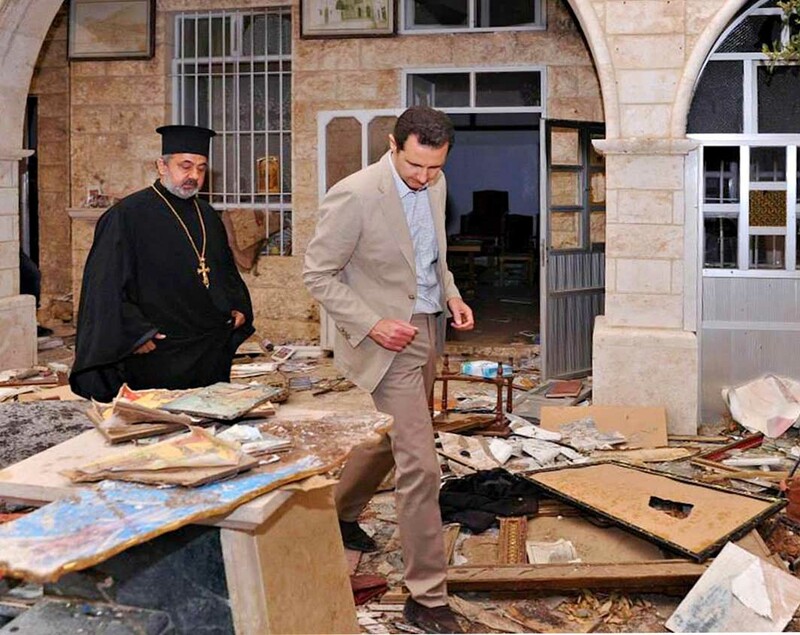 The Lord gave me this responsibility in Syria, and I cannot simply accept that during my mandate, the Christians disappear. I’ll never stop fighting so they can hold on. Crux: Do you believe there’s no alternative to an international military force to dislodge Islamic State? Jeanbart: As far as Syria is concerned, there is an alternative. Nations such as the United States could pressure Turkey to stop allowing mercenaries to pass through its airports and borders. The same applies to Jordan. The army of Syria would be able to handle things very quickly if these terrorists are not fed money, weapons, fighters, and logistical support. Crux: You don’t see a need for boots on the ground? Jeanbart: It is not needed. I would like an international coalition committed to stopping the war, but they don’t need to come in. They just need to stop feeding the insurrection and terrorism. Jeanbart: I would say the situation is different, because the country’s structures have been destroyed and they’re rebuilding their army and national unity. They may need more help. Crux: Over the years, Christian clergy in Syria have been accused of being too close to the Assad regime. What’s the truth? Jeanbart: We are not pro-Assad. We’re in favor of a government that’s open to all denominations. We’re in favor of a secular government. It may be led by Assad or someone else, but that’s what we want. Personally, I would say that Bashar al-Assad is a good man. I don’t want to pass judgment beyond that, but I’ve met him a couple of times and all my colleagues, my fellow bishops and the priests and nuns, appreciate him. That doesn’t mean he’s an angel. Crux: Is the realistic choice not between Assad and democracy, but Assad and IS? Jeanbart: In a sense, yes. If we have to choose between IS and Assad, we choose Assad. If the choice were between a real democratic opposition and Assad, we’d wait and see. We’d leave our faithful free to do what they like. It seems sometimes that all the countries of the world are against Assad, but we feel we don’t have any other alternative. Honest to God, this is the situation. I think Assad wants to reform. Let him prove his good intentions, and let’s give him the chance to see what he will do. Crux: What’s your view of the role Pope Francis has played regarding the Syria conflict? Jeanbart: The first time I ever heard a Syrian government official saying a word of thanks to the Catholic Church was when our foreign minister, who’s the second most important figure in Syria, declared thanks for the Holy Father’s position against Western air strikes on Syria in 2013. For Syria, a Muslim country, to recognize that the only one in the world who stood with us and stopped it was very important. All Syrians will never forget it, and for us it will always be a source of pride. What would have happened would have destroyed all of Syria, like what happened in Iraq, what happened in Libya, and what’s happening now in Yemen. Crux: Spiritually, how do you make sense of what’s happening in your country? Jeanbart: Reading the Gospel and trying to see things that way, I think about how the Devil manifests himself and his actions. We read in the Bible that he is the father of lies, the master of money, and the lord of blood and death. We see all three in this war: It’s a blend of money, lies, and blood. Of course I know there are strategic dimensions to it, but sometimes I think perhaps ultimately this is a Satanic work, because it’s almost impossible to understand otherwise. Crux: Last fall, there was a Synod of Bishops on the family that triggered massive debates over matters such as Communion for the divorced and remarried and outreach to gays and lesbians, and this fall, another synod will likely take up the same issues. Does it frustrate you that the life-and-death challenges facing Christians in countries such as Syria often don’t seem to attract the same attention? Jeanbart: Yes, indeed. Of course the bishops have to talk about the topics they’ve been given, but the suffering and death of so many people in our country, and the huge sacrifices they are making to remain faithful to the Lord, seems to be forgotten. What I see, both in the Church and society in general, is that they’re discussing everything else, but they ignore the execution of our people.